A People’s History of Christianity is not so much a “history” (either scholarly or general) as it is an argument for a return to the roots of Christianity that finds fault with both modern expressions of “liberal” and “conservative” religion. As Bass argues in her introduction, liberal theologians and congregations tend to lose their “devotional” memories; their conservative cousins lose their “ethical” memory. The result is a liberal tradition that’s often little more than a social club; and a conservative tradition that’s often reactionary and mean spirited. Bass comes from an unabashedly liberal perspective by which I mean she rejects – or is, at least, chary of – Christologies used to justify the state, the Church (in the “big C,” institutional sense), church wealth, war, etc. Her Christ is the preacher who counsels the rich young man in Mark 10:21 to “Go your way, sell whatever you have and give to the poor, and you will have treasure in heaven; and come, take up the cross, and follow Me” and says in 12:29-31, “The first of all the commandments is: `Hear, O Israel, the Lord our God, the Lord is one. / And you shall love the Lord your God with all your heart, with all your soul, and all your mind, and will all your strength.’ This is the first commandment. / And the second, like it, is this: `You shall love your neighbor as yourself.’ There is no other commandment greater than these”; or the Church as represented by the spirit of Vatican II (though Bass isn’t Catholic herself – I gather she was raised Methodist, and now professes Episcopalianism). I am not the audience for this book, or not the primary audience. There’s too little in the way of history to engage my interest, and too much theology whose foundation I reject. Full Disclosure: I was raised Catholic in a thoroughly secular, middle-class American family in Missouri. Before my parents’ divorce, we didn’t even go to church. When mom did begin taking us and enrolled my siblings and me in weekly religion classes, I fell in love with Catholic ritual, history and tradition, and the cool robes the priests got to wear, but I was not wedded to (nor even terribly aware of) its theology until I got interested in such topics in college, and then I became an Origenist. It’s been downhill (from the Vatican’s POV) since then. Which is not to say that I didn’t get something from reading this book. I have scads of post-it notes littering its pages reflecting what I learned of the variety of ways Christians have interpreted Christ’s teachings through the ages, and how the “popular impulse” – often co-opted or suppressed by the institutional Church (cf., the Franciscans** or the Beguines, respectively) – keeps bubbling up to the surface to discomfit the privileged and the comfortable. **If you want to learn more than you could ever possibly want to know about the medieval Franciscans and the related popular movements that bedeviled the Roman Church, I can’t recommend enough Umberto Eco’s The Name of the Rose. And within those sections (except for the last), each is further divided into a look at “devotion” and at “ethics” – How Christians interpreted the New Testament and how they implemented what they learned in the real world. 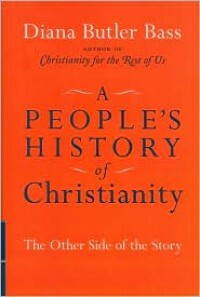 For example, in the “Ethics” of “The Way,” Bass recounts how early Christians lived a Christ-centered life: 1. hospitality - all comers were welcome; 2. communalism - all property was held in common by the faithful; 3. peace making - early Christians were pacifists by and large*; 4. aliens - all humans were “neighbors,” even if they remained outside the church. *St. Valentine, whose feast day we recently celebrated, was a soldier who refused to fight, as was St. Martin of Tours; and one of the chief “crimes” committed by Christians was their refusal to serve in the legions. An example of some insights found in Bass’s “Devotion” sections: In “The Cathedral,” she devotes much ink to Peter Abelard and Heloise, arguing that they were representative of the interpretation of Christ’s Crucifixion as an expression of God’s infinite love for Man, and not a sacrifice to atone for his myriad sins and to satisfy justice. Each period deserves, at a minimum, a book-length treatment of these subjects.